The morning promise to my three kids for twenty one years. Wake up you little sleepy heads, its a brand new day. I still appreciate that gift, feel it in my own heart and mostly try and chart my waters in that general direction. Get something done. Something positive if you can, but if you fail, that’s only a life lesson. Some times you have to do things twice. Doing some remodeling out at the homestead. Special ordered doors arrived, picked up, brought home. Tsk, tsk. Wrong width. Lesson learned. Measure twice, cut once. A long drawn out segue to some big news. This time with double attention to detail. 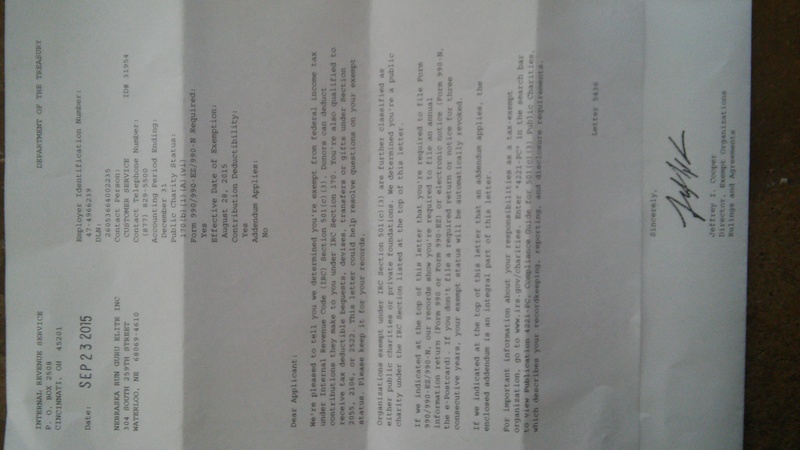 Nebraska Run Guru Elite, Inc. received our 501 (c) (3) not for profit public charity status this week. Please think of us as worthy when considering your year end charitable contributions. runguru@cox.net We’ll have our IRS documents posted up top as a tab once I wrangle the scanner. Thanks especially to our sponsors, The Lincoln Marathon and Stodden Physical Therapy. This entry was posted in Uncategorized on September 30, 2015 by runguru. Now that I have your attention. I do go on about my old buddy Sean Wade. It was 20 years ago that he won my Run For The Arts 10 Mile in a fast 47:55. One oh three thirty half marathon pr. Commonwealth Games Steeplechase for his native New Zealand. He’s just a few trips around el sol before he hits a major milestone, his fiftieth birthday. 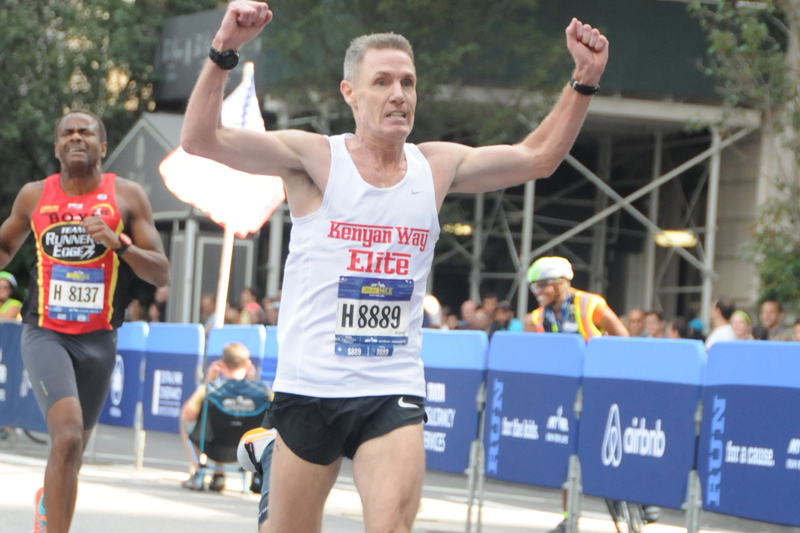 He won the 40-49 age group at the recent Fifth Avenue Mile in a very fast 4:25. In February and the big five oh, he’ll take a crack at running sub 4:20. Sean Wade, my 2015 USATF Nebraska Association Fantasy League Grand Prix Champion. This entry was posted in Uncategorized on September 29, 2015 by runguru. But first, congrats to Pete Kostelnick for the win at the Monument Marathon (2:52:56) and his lovely wife Nikki making her 26.2 debut a 4th o/a female in 3:43:29. The knowing hand deftly moves and the tumblers gently fall into place. Like any true craftsman, the touch intuitive. Coordinating the eyes and ears and fingertips. If I’ve worn my heart on the old sleeve you know I haven’t been really pleased with the state of competitive distance running in Nebraska, for the last three years or so. A lot has changed. Even me, but only in the right ways I hope. The mission? Excellence locally, regionally, and nationally. It started with Drew, and then Kevin, and last week we added Jay. I proclaimed that trio as potentially 3 of the best in Nebraska. We’ve added our fourth. 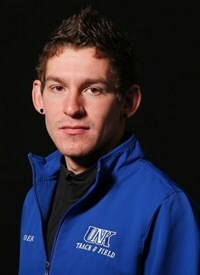 *Costa Rican XC National Champion *Al has dual citizenship with Costa Rica and the U.S.
Click. Click. First up, bringing the Living History Farms team title back west of the Missouri, where I like to insist it belongs. Easy going on the outside, damn fierce on the inside. Welcome Mate! This entry was posted in Uncategorized on September 28, 2015 by runguru. A buddy of mine from West of the Platte did a double check with me last week. Wanted to make sure I wasn’t bs’ing about turning down a trip to Hungary and passing it along to Ann. Yes, yes, true as the day is long. I was happy to read that Mike Morgan has been awarded one of 12 RRCA grants, $2500 towards expenses as he trains up for next year’s Olympic Trials Marathon. He also receives an additional $500 because he is a previous RRCA Roads Scholar winner. Which reminded me that I wrote his nomination letter back in 2005. On top of his game for over 10 years now. Who will step up to fill his shoes? Chef Paul Braunschweiler was one of the first runners I met after moving to Omaha in 2001. Had a finish line photo from the Chicago Marathon on his wall. Introduced myself right away. He told me he’d be ever so happy if he could get into NYC, damned lottery and all. I called David Monti, Professional Athlete Coordinator for the race, he took care of it and Paul got to race through the burroughs. I called my old buddy and Boston Marathon RD Dave McGillivray seven or eight years ago. Tom Whitaker, perennial Omaha Running Club Pres and his lovely wife wanted to get into Boston. Can you help a brother out? You bet. He’s done that more than a couple times, great guy. In 2009 I asked Gary Bredehoft to be the Team Leader for the squad of mates I sent to NYC, the Men’s DMR setting a club national championships record. He knows how it used to roll. Have a fun and fast weekend! This entry was posted in Uncategorized on September 25, 2015 by runguru. Sixteen candles for sixteen days. Good end for this fall’s bees wax. One for each day since my last run. I’m walking without a limp now, mostly. Only succumb to the knee brace when vigorously gardening. Two mile walk just completed, first real locomotion. Eighty five strides per minute the entire way. Sensing that movement itself lay at the base of my life long love of running. Speed matters, just going turns the key though. I’ve watched and felt my thighs do their best Houdini, atrophy while healing, to the point where I’m at square one when and if I ever can return to running. Working on my head. The Mind is the Athlete after all. Completely focused this morning, getting the absolute maximum benefit out of the 28:30 I allowed as introduction to pedestrianism. Knowing I’ve got to walk before I dare dream again. Cadence. Posture. Heart rate. Respirations. See? Just the tiniest bit like running. And still, in that tiny corner of my mind. Running. My ultimate freedom. My ultimate honesty. Like an ember. Just waiting. For another go. This entry was posted in Uncategorized on September 24, 2015 by runguru. Impressions on Pope Francis. Deplaning Shepherd One, his cape like Superman in the winds. Sweet robe and cool little beanie. So well dressed top to bottom. Well spoken, his message bigger than mere words. Tolerance. Helping less fortunate. All the best stuff you’d expect from a pontiff. Hope at the very top. Universal message. Servant of the entire world. The Dali Lama should have been given a similar stage. This entry was posted in Uncategorized on September 23, 2015 by runguru. It was my pleasure to have Jay Welp out this past Sunday, interviewing for Willie’s Golden Ticket, aka Nebraska Run Guru Elite. It is my privilege this morning to announce him as our newest mate. During the two way interview we found out a lot about each other. Our opinions on the climate of running and racing today in Nebraska. One thing I have been stressing to every athlete that comes out to the Bar None- What a great time it is to be a competitive distance runner! Three clubs actively pursuing the services of the swiftest. 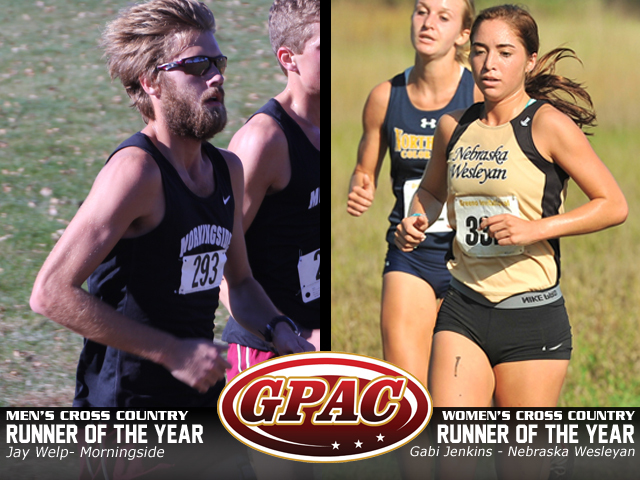 Jay competed for Morningside University, graduated last year as the GPAC XC Champion and XC Runner of the Year. Which is pretty slick when you consider Nebraska Wesleyan, Concordia, Doane and Midland all hang their spikes in the same conference. He’ll have a good idea on the local racing waters going in. I’ve heard rumors that Team Nebraska and LRC Racing are engaged in discussions towards creating a “Super Team” by combining their resources and runners. I’ve been asked how I couldn’t be interested in such an enterprise. I’ve no time, I’ll develop my own thank you very much. This one will remain by interview and invitation only. I’ve learned more than I thought I knew. Jay Welp. Kevin Joerger, Drew Prescott. This trio, quite possibly 3 of the top 5 runners living in Nebraska. 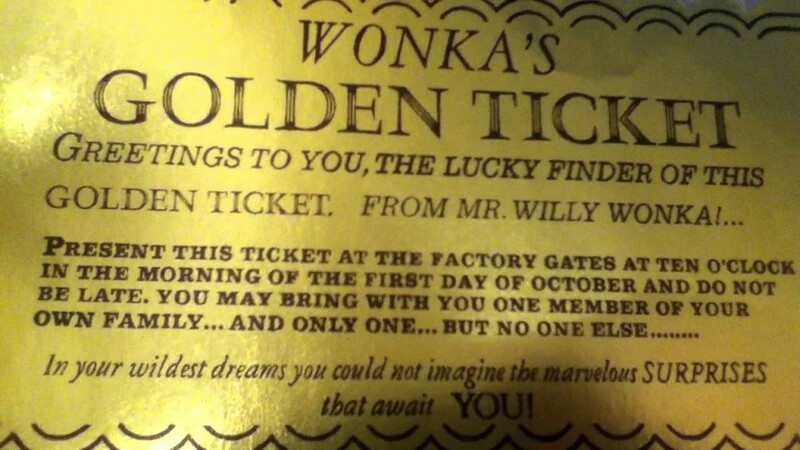 And there are still 2 golden tickets out there. You know who you are because you’ve already received them. I’ll wait to reveal them on Monday. And then, we are coming, quickly, to reclaim the national prominence and respect that Nebraska athletes deserve. As I define it. As these athletes that join us define it. We are already there in the ultra realms. No questioning our heroes, Kostelnick, Morris, Clouston, and Schurman. They are making big marks in their arenas. And enthusiastically join me in welcoming their kindred road spirits, our speed studs. Here’s the plan, because I have confidence and juevos mas grande de todos: repeat our top spots at the Lincoln Marathon, and take the top 5 men’s spots in the half. That’s the ticket. This entry was posted in Uncategorized on September 22, 2015 by runguru. Or not. More relative yawners between the gun and tape this weekend. Fun Run in Lincoln Friday night, the Omaha Marathon yesterday. Woody Greeno sandwiched in between, the only competitive action anywhere, thank goodness for the fall xc classic. I made it down to TD Ameritrade to check out the start of the marathon. Looked for Jennifer Wilson to offer final encouragement. Couldn’t find her in the crowd of 2500 people. A busy professional, she let me know when we started in May she had only 3 days a week available for training. Debut, bucket list. Goal of 5 hours. 5:03. Nice. Something that stuck out in my mind? No race clock anywhere near the finish line. Alien looking transponders peppered everywhere, but nothing to capture the moment/result. No one complained but me. Shannon Suing ran a fine Freedom Run Half (1:21:14) on Sept. 13th. Seven days later she won the Omaha Half (1:21:59). Back to back quality half marathons three weeks out from Chicago. I better pay attention. Bree Adams is making her 26.2 debut at Twin Cities. She’s run only one race in the entire build up, Freedom Run 10K, her first race since college in fact. Precocious twenty two year old, future is so bright! Her last long run this past Saturday, 23 miles at 7:30 pace. You better pay attention. This entry was posted in Uncategorized on September 21, 2015 by runguru. Wind up, wind down, wind up again. Much of last winter spent diagramming eighty feet by sixty feet, what would go where, through successive plantings, careful not to repeat the previous year’s pattern. Pretty much nailed it. And along the way, a couple of developments that necessitated a 33% expansion, reconfiguring, and operational executive decision making. A dynamic quilt of farm fresh, best organic practices if you will. The newest trick is learning how and what to grow over the late fall and into winter. As dictated by the customers. Boutique, that’s my story and I’m sticking to it. Mini hoop houses now dotting the Bar None. Collards, carrots, spinaches, lettuces, parsnips already emerging, all manner of other winter root vegetables slated for the raised beds I’ve been constructing this week. And always with the Good Housekeeping. Clean as a whistle around here. Especially the chicken coop, daily attention ensuring a welcoming environment for everyone, Bar None. Yielding two dozen/day. Sell all we can, eat what we want, barter or give away the rest. This year’s honey the best I’ve ever tasted if not as much as I’d hoped for. Best because it came from right here on the property. Almost everything does at this point. Go into “town” once every couple of weeks for dry provisions (flour, rice) and a couple of wet ones (milk, beer). The only needs not met by our own labours, not yet anyway, Linda with plans on adding a couple sheep or a cow to address our unmet dairy needs. Me keeping a keen eye out for a grindstone. Learning as we go and as we grow. This entry was posted in Uncategorized on September 18, 2015 by runguru. Day three and not a peep. No wonder most people don’t want to be involved in the day to day business as usual. Hopefully just enough people are going to continue the chase. As mentioned Monday our USATF Nebraska Assoc. meeting was Sunday afternoon. A lot of talk, so much talk, talk, talk, talk. But where’s the walk, walk, walk? A demerit for our association for failure of the LDR committee to post information on our website. Colin Morrissey’s minutes from the LDR breakout are still not posted. I emailed our association President, John Wissler and membership chair Cindy DeSantiago on Tuesday morning, looking for the email of Darwin Gushard, our association webmaster. Still have not heard back from either. Had to go to everyone’s favorite Monkey Wrench for the contact info. Minutes submitted Tuesday afternoon, copying everyone present at the meeting as well as Wissler and DeSantiago. Still nothing. And I’m sure the webmaster position is a thankless task. No less the membership chair. That is why Darwin receives a $1000 stipend for his duties. Cindy receives $1250 for hers. The only two positions in our association that have a built in stipend for services. So no wonder you are only interested in the Grand Prix prize money and not the daily hassle and grind of red tape. I hope that is enough. Member Services: USATF is centered on member services and serving the athlete. Members in Nebraska shall no longer have to declare that they are a USATF member in order to participate in championship events and be scored. Defining the roles of our LDR chair: A committee was set up to define the duties of the LDR chair. The committee is comprised of Colin Morrissey, Will Lindgren, Linda Kunasek, and Michael Hajek-Jones. The committee in due time will publish the roles of the LDR chair holder. National USATF Annual meeting in Houston: 15 open spots were available to send members to the annual meeting in Houston. Will and Linda volunteered to represent our LDR program at the annual meeting. It was approved that those going to the meeting would each get a $300 stipend towards travel related expenses. This entry was posted in Uncategorized on September 17, 2015 by runguru.